James Wellbeloved wet cat food pouches are suitable for cats, kittens and senior cats. They have been developed to suit cats which are prone to allergies and food intolerances. This balanced, tasty moist food is hypo-allergenic and avoids those ingredients known to cause food intolerances. It contains no eggs, dairy, beef or pork, nor does it contain artificial colours, preservatives or taste enhancers. It is wheat, gluten and soya free and the only source of animal protein is either tasty turkey or lamb. The carbohydrates are from carefully selected sources (potato and caΒava). 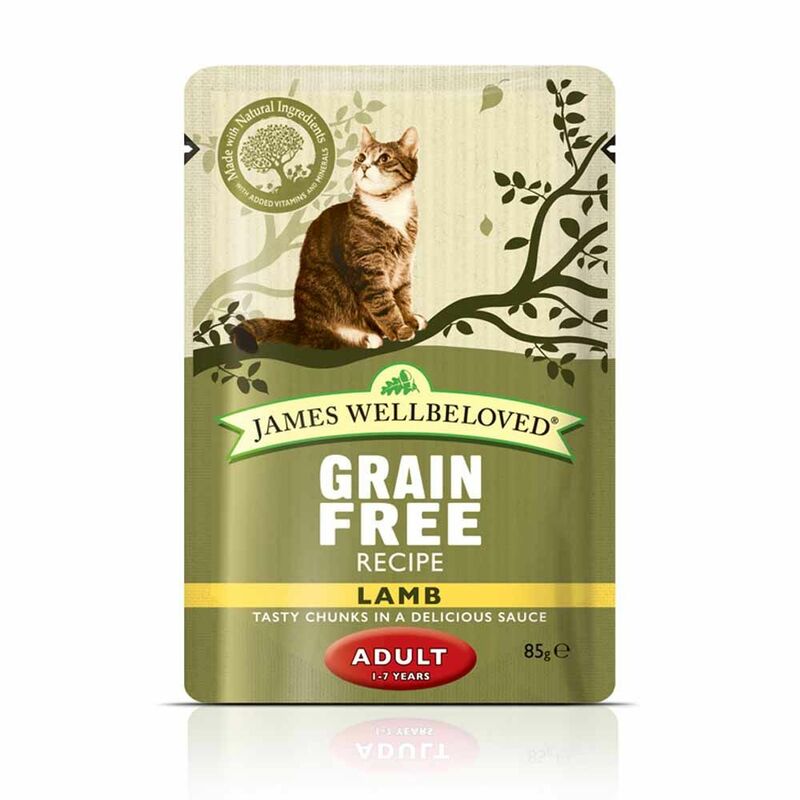 James Wellbeloved cat food in pouches is made from natural, wholesome products which are enriched with linseed oil. This oil is rich in unsaturated fatty acids which help to support healthy skin and shiny fur. It is also made with chicory extract which contains prebiotic inulin. This is good for your pet's digestive system and helps to maintain a balanced gut flora. Yucca extract can help to reduce stool odour. This delicious moist food uses only the very best ingredients and is enriched with vital minerals and vitamins. James Wellbeloved wet cat food is a complete dietetic wet food. It comes in convenient pouches and provides your pet with a balanced, tasty meal: Great-value saver pack: 48 x 85g pouches at a low price! Complete, balanced food: For all cats, especially those prone to food allergies Mono protein: Only contains one source of animal protein Grain and gluten-free: Only potato and caΒava as a source of carbohydrate Hypo-allergenic: Easily digested and well accepted Excludes the most common causes of adverse food reactions. It reduces bad gut flora while improving good gut flora. Yucca extract: Reduces stool odour Carefully selected, natural ingredients: Premium quality for a great taste Minerals and Vitamins: For a balanced, holistic cat nutrition Now also available in a great value: Adult Mixed Saver Pack: 24 x 85g Adult Turkey 24 x 85g Adult Lamb Kitten Mixed Saver Pack: 24 x 85g Kitten Turkey 24 x 85g Kitten Lamb Senior Mixed Saver Pack: 24 x 85g Senior Turkey 24 x 85g Senior Lamb More information about the individual varieties can be found here: James Wellbeloved Adult Cat Pouches James Wellbeloved Kitten Cat Pouches James Wellbeloved Senior Cat Pouches.